This is the shocking moment a woman brutally slaps a member of staff at a Chinese airport who told her she could not carry oversize baggage on board. According to the People's Daily Online, the incident took place on October 27 at Hangzhou Xiaoshan International Airport. A female passenger confessed to the beating and was detained for seven days and fined 200 yuan (£24.23). According to reports, the female passenger surnamed Zhang was carrying a large suitcase and insisted on taking it onboard with her. She told the security officer that she had to take a flight to Harbin while her children and the nanny were catching a flight to Shenzhen. The female officer told her that she should check in her bag as it was oversized. When she was told this, the passenger forcibly slapped the security officer. When the female security officer told her she was not allowed, the woman forcibly slapped her. The security officer was temporarily deafened by the slap and was taken to hospital by colleagues. 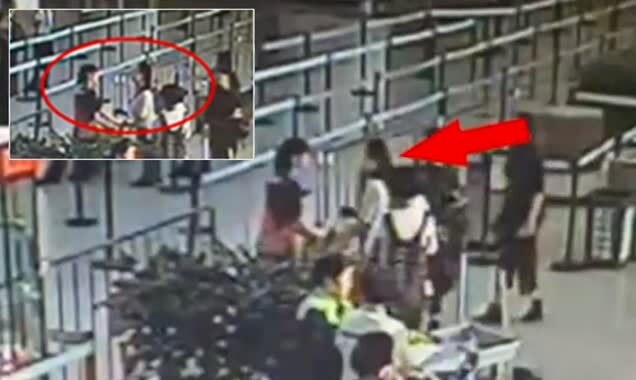 In the footage the passenger can be seen talking with the security officer before suddenly Zhang slaps the officer. The video has shocked internet users on China's social media site Weibo.